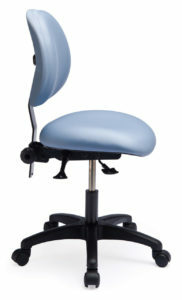 The Ergo F Series is designed to provide ergonomic support for employees working in a laboratory setting. The modularity of the chair makes it suitable for both seated and counter height workstations. Featuring dual density foam and a contoured backrest available in two sizes makes the Ergo F Series ideal for a variety of users working in laboratory and cleanroom environments. Federal Standard 209E, Class 1, 10, 100 & 1000 environments. ISO 14644-1 Class 3, 4, 5 & 6 environments. | 2016 © Corporate Furniture Group inc.